Knowledge on these posters is limited, so if you have any information about these, or any gems of your own hidden away, I’d love to hear from you! 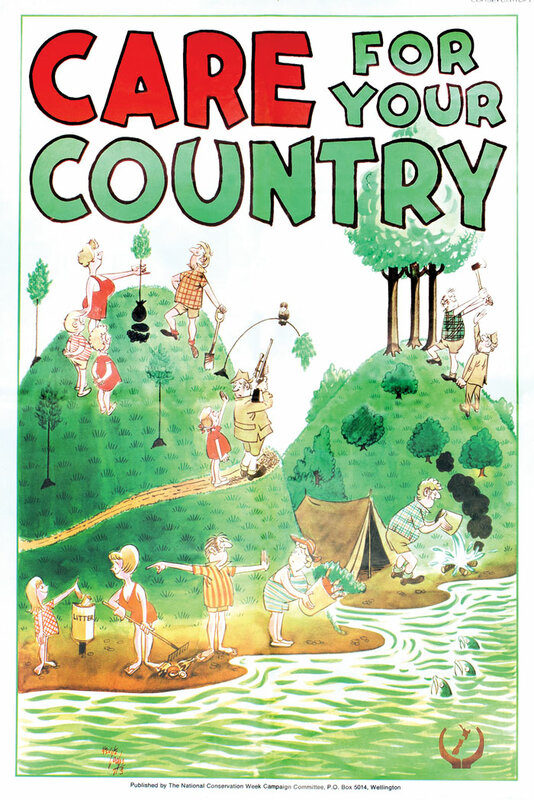 This is by the famous Wellington cartoonist Nevile Lodge who must have been specially commissioned to do this poster. This is a favourite for many. 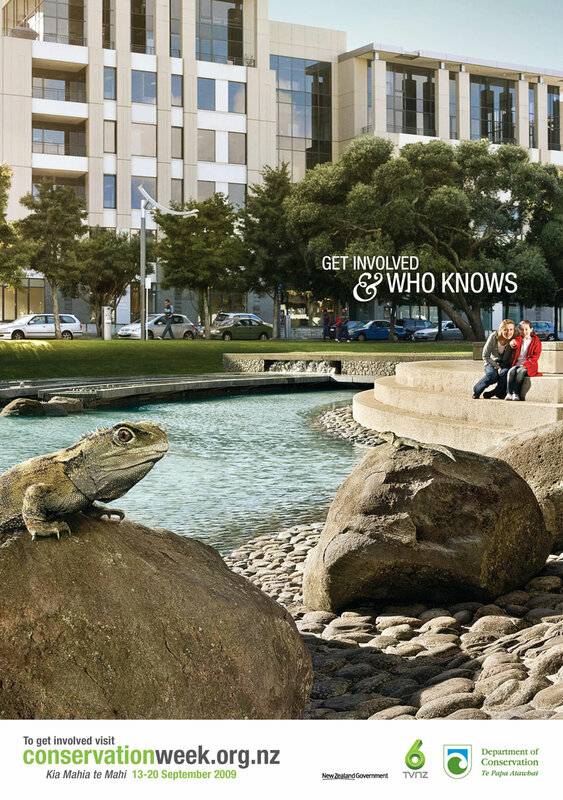 It was designed by Howard Campbell and was the winning entry in a competition sponsored by Todd Group and WWF. 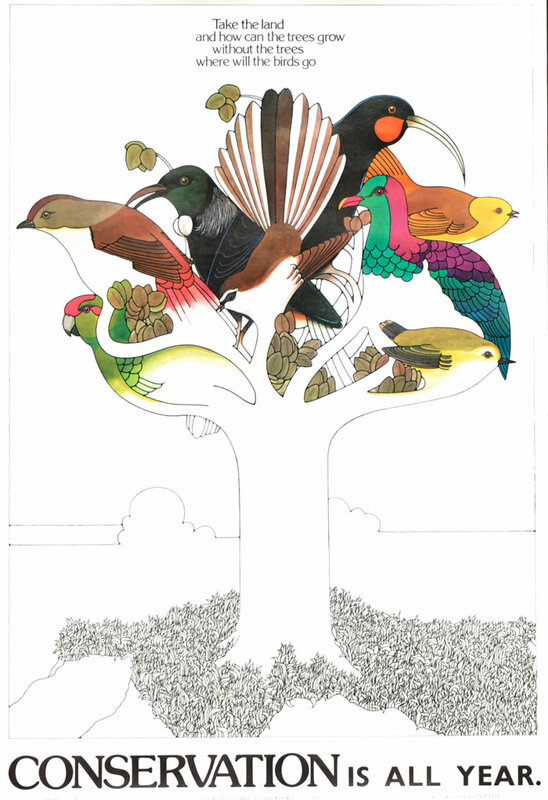 This lovely poster was created by Don Binney, produced for the National Conservation Week Campaign Committee, with assistance from the L.D Nathan Group of Companies. 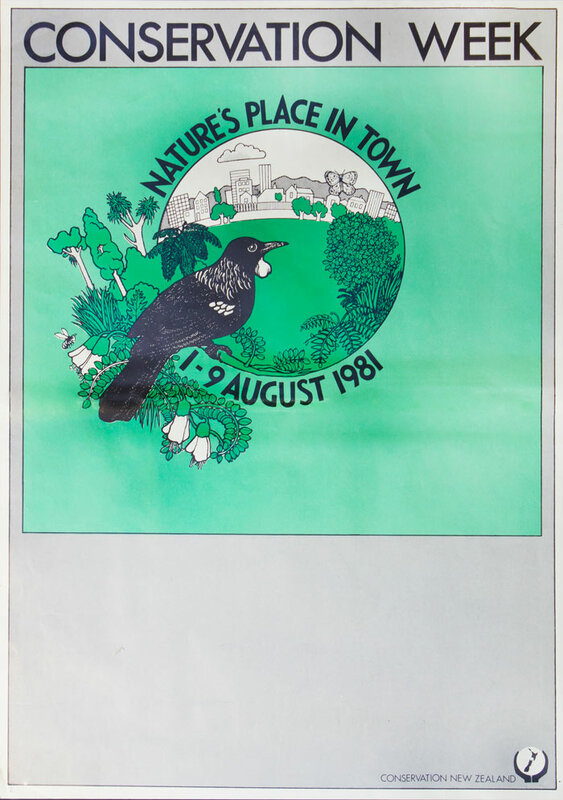 And we move into the eighties… A Conservation New Zealand poster; simple, and to the point. It’s Conservation Week, but this guy doesn’t look too happy about it. Nice inclusion of Arbor Day messaging though. 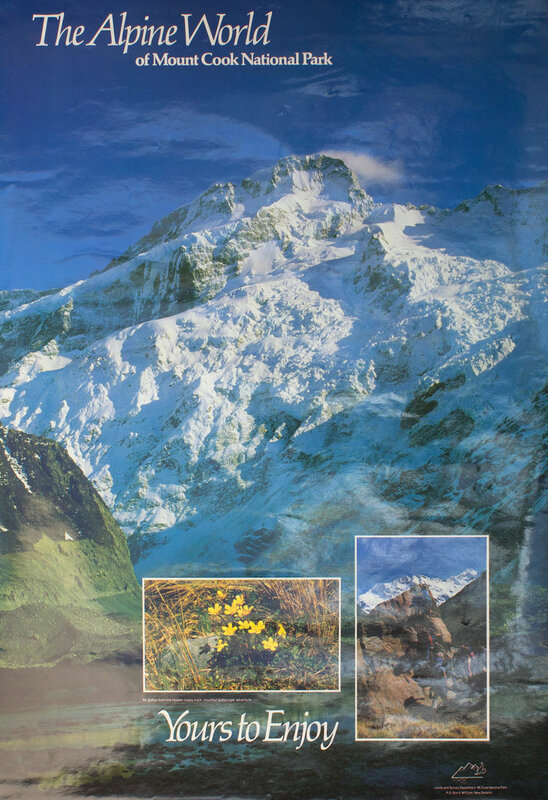 This poster was developed at Mount Cook in the mid 1980s in conjunction with the publication of an A4 book The Alpine World of Mount Cook National Park. 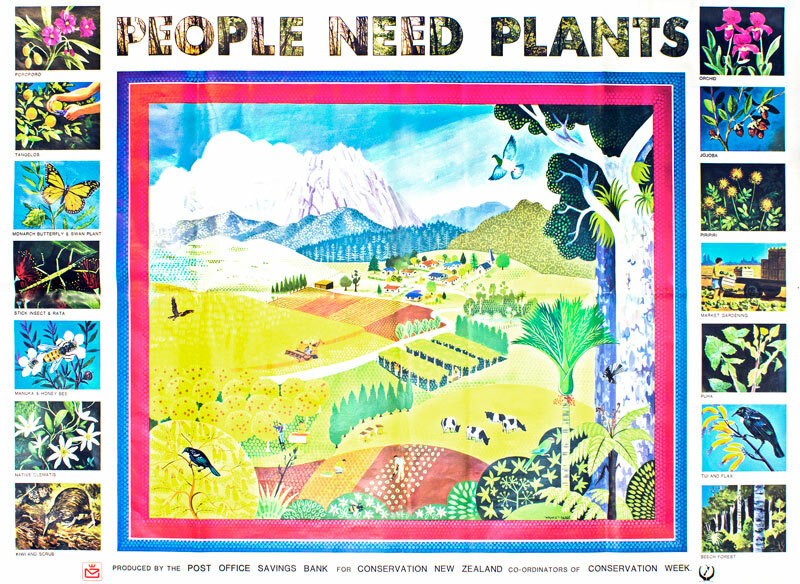 A similar poster was printed for Tongariro National Park, but the concept didn’t get used for a wider national message. Len Cobb from Cobb/Horwood, who did many of the National Park A5 handbooks, did the production. 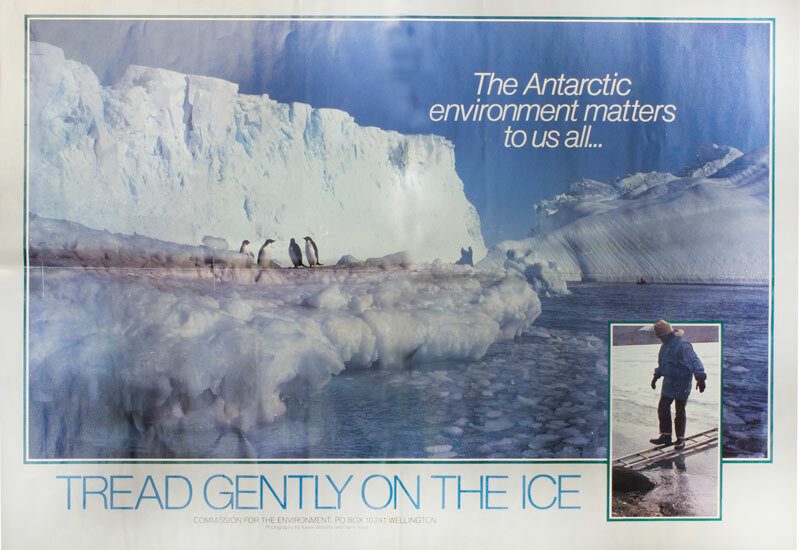 This poster was produced by DOC staff member Harry Keys when he worked at the Commission for the Environment (CFE) in the mid 80s. CFE had become part of the government’s delegation at meetings of the Antarctic Treaty parties which, at the time, were dominated by the question of how to assess proposals for mineral and hydrocarbon exploration and development in the Antarctic region. It was widely displayed in post offices throughout New Zealand. It’s true. 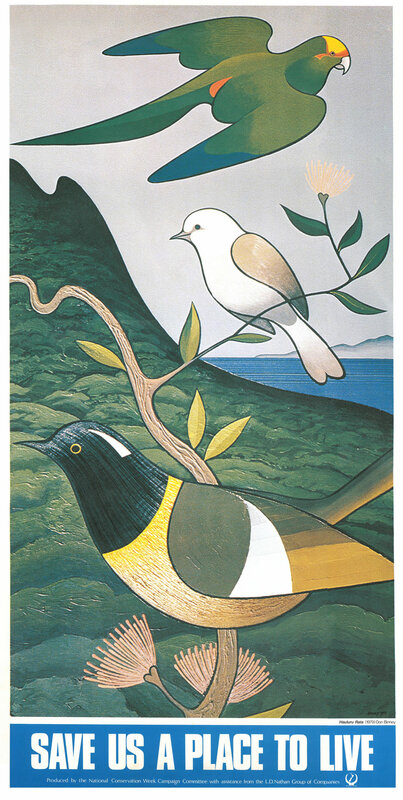 A lovely landscape produced by the Post Office Savings Bank for Conservation New Zealand. 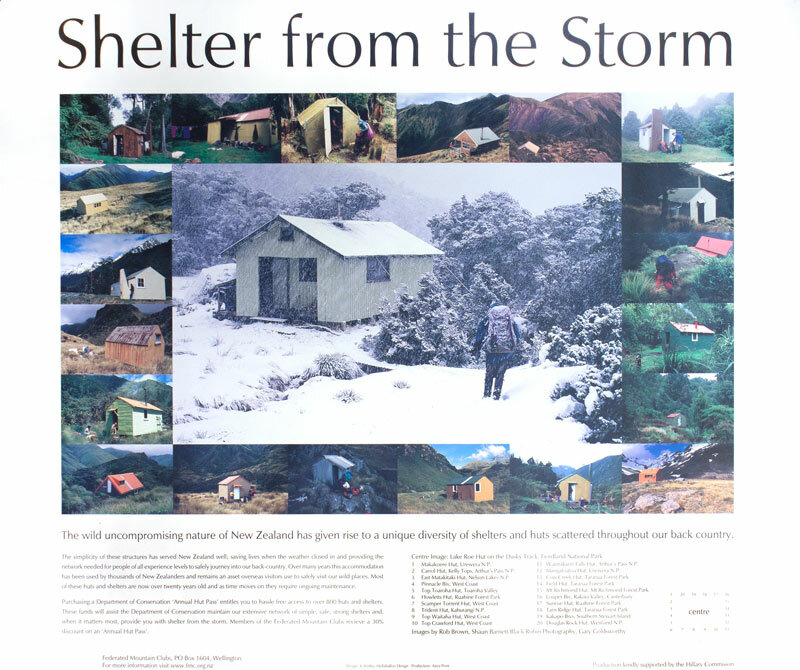 The wild and uncompromising nature of New Zealand has given rise to a unique diversity of shelters and huts scattered throughout our back country. This collection of images was put together by the Federated Mountain Club, supported by the Hillary Commission. Something for everyone! Contact your nearest Forest Services office for a wide range of experiences and recreational activities. 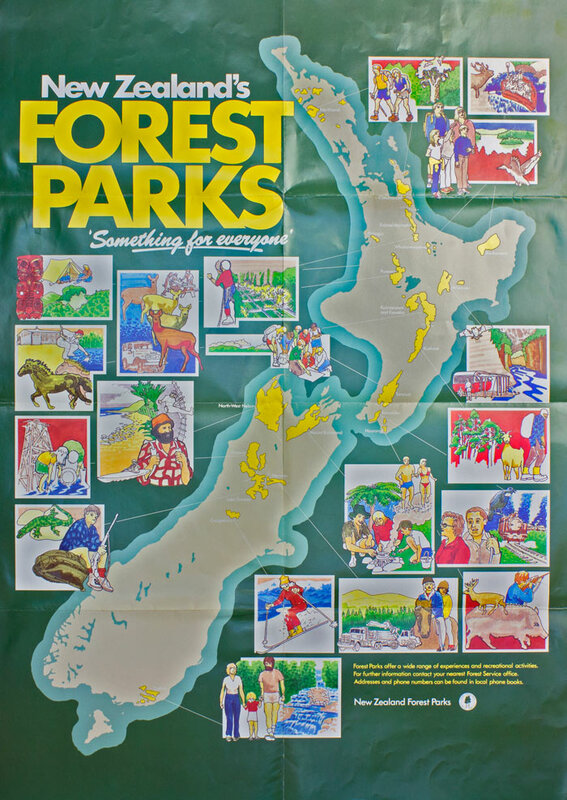 Produced in 1985 for International Year of the Forest. This poster was designed by Saatchi & Saatchi – a snapshot of the future! 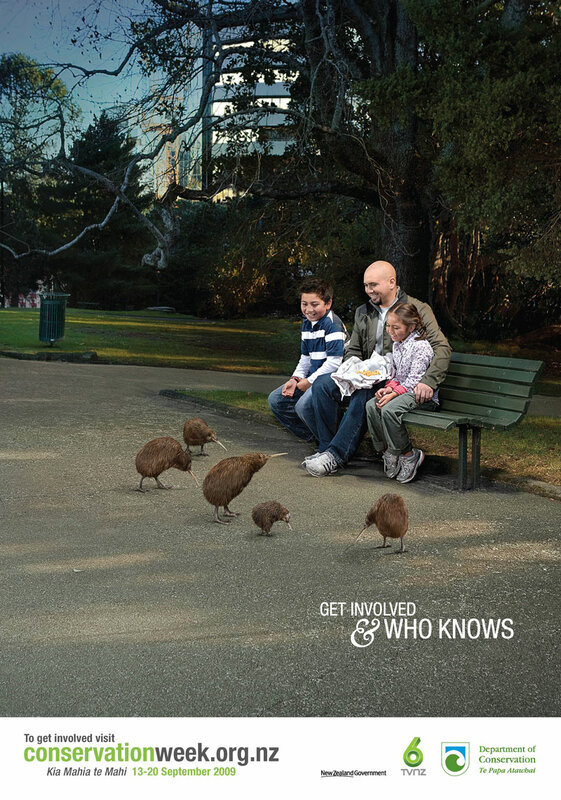 Get involved in conservation and who knows… a clever campaign that conjures a whole heap of ‘what if’ thoughts. So, what is your favourite poster? Vote in our poll (below). Any memories around these? If you have info to add about any of these posters, comment below and we’ll add it to the descriptions. If you have copies of your own posters that you’d like to share, leave a comment and I’ll get back to you. 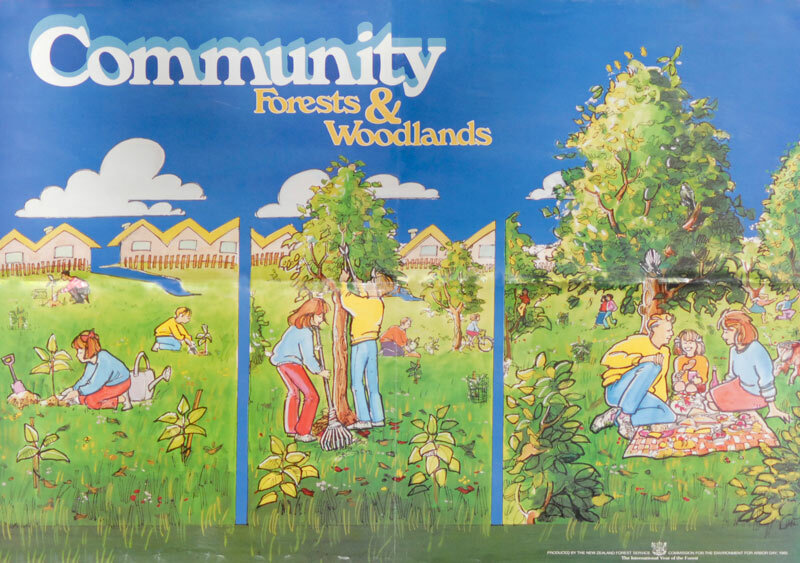 In the early seventies, Conservation Week came under the umbrella of the Nature Conservation Council, with other agencies and organisations represented on a Conservation Week committee. Each year, with sponsorship, it produced a promotional poster and a themed teaching poster with teachers’ notes. There was a great series of posters drawn by students from a technical institutue, can’t remember when or where, but anyhow they were about different ecosystems… I thought they were great illustrations of flora and fauna and would love to see them reproduced. I remember getting ‘Save Us A Place To Live’ as a poster and also a bookmark, I think, at primary school. I had the poster on my bedroom wall for ages. Have now got it on my one year old daughters bedroom wall. More for me than her though I reckon, not too sure she quite gets it yet! Awesome trip down memory lane!